New Beginning Church of Deliverance gets a core group of men volunteers to help restore the plumbing at the House of Refuge, homeless shelter owned by Pastor, Dorothy Wilson. The estimated cost for repairs would have been in the thousands of dollars. Not only did volunteers help with repairs but volunteers also donated their time. Mr. Floyd Penny volunteered to help at this homeless shelter by providing not only his time, but he supplied his trailer with tools that were purchased out of his own pocket. Penny is an electrician, plumber, property owner and member of Soldiers for the Lord. Penny started Soldiers for the Lord, a group of Christians who complete minor home repairs for all who qualify, without charge. Penny was joined by his colleague Carey Wilson, member also of Soldiers for the Lord, the Bishop of New Beginning Church of Deliverance and retired general contractor, City of Cape Girardeau, Public Works workers,Bruce Baker, owner of Regional Property Maintenance, Vincent Kelly and Wife, owners of Nip Kelley Equipment Company, Gary Alberternst, Rick Kelley, Donald Coster, and Randy Heise. The House of Refuge is not a Government funded homeless shelter. 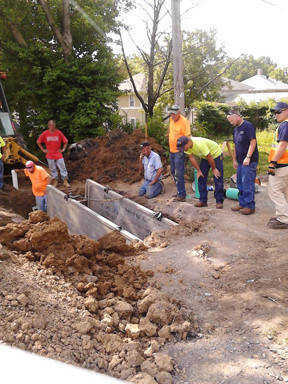 This plumbing project would not have been completed if these volunteers did not help with repairs and donate their time. House of Refuge provides shelter for men and women. It helps keep the homeless from living on the streets and helps them get back on their feet. This homeless shelter is operated mainly on donations provided by local contributors and church fundraisers. For more information about The House of Refuge or to make a contribution to future repairs that are needed, call (573)334-5158. Very impressive. Thanks and congrats to all.